If "4K" describes both the resolution you want and how much you want to spend, the JVC DLA-RS440U ($3,999) and the Optoma UHZ65 4K Laser Projector ($4,495) are two prime home-theater candidates. Both deliver solid image quality but with different sets of features. For example, the RS440U adds powered zoom, focus, and lens shift along with lens memory, while the UHZ65 offers a laser-phosphor light engine with 20,000 hours of life and an actual 4K image rather than the RS440U's close approximation of 4K using pixel shifting on 1080p panels. We've reviewed each of these projectors separately, so read both reviews for more detail: (JVC DLA-RS440U review ; Optoma UHZ65 review) In this article we'll focus on the advantages of each and the differences between them. Both the JVC RS440U and Optoma UHZ65 deliver the level of image quality you would expect from the price, with sharp detail, good color accuracy, high contrast, and a notable sense of depth. Both also have video processing features like frame interpolation. 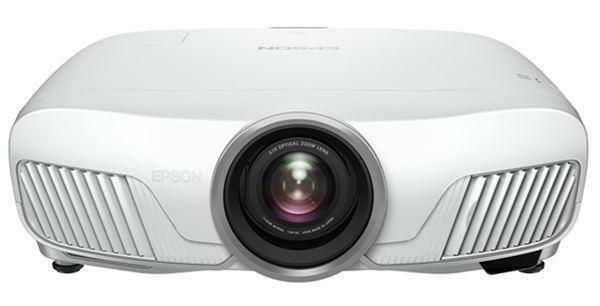 The two projectors are closely matched in image quality, but there are some differences. Resolution. The RS440U marries native 1920x1080 chips to the latest generation e-Shift-5--JVC's version of pixel shifting-- yielding a much higher effective resolution than 1080p on screen, but less than 3840x2160. The UHZ65's 4K DLP chip does pixel shifting as well. But since it is working with 4.15 million mirrors on the chip, it puts twice that number of pixels on screen and is capable of defining 8.3 million addressable pixels, for a true 3840x2160 image resolution. At a typical seating distance from the screen, an eagle could see the difference, but the human eye can't. By pausing a movie and getting within one or two feet from the image, I could tell that a tiny number on a filmed medical display was clearly a 6 on the UHZ65, but it looked more like an 8 on the RS440U. At any reasonable seating distance, you need better than 20-20 vision to notice a difference in overall picture resolution. Contrast. The RS440U delivers a much darker black than the UHZ65, but that doesn't translate to better contrast. The official contrast ratings are 400,000:1 for the RS440U compared with 2,000,000:1 for the UHZ65. But that does not translate to five times the contrast for the UHZ65 either. In a side-by-side comparison, using optimized settings, the two deliver similar levels of contrast which shows in color saturation popping nicely as well as in the sense of three-dimensionality. Neither projector has a decisive edge in contrast. Each one can look incrementally higher in effective contrast than the other depending on variances from scene to scene. That said, the RS440U has an advantage in one circumstance. The UHZ65's contrast drops noticeably at lower power levels. So for screen sizes that are too small to use the highest lamp brightness on the UHZ65, a reduction in brightness power will reduce contrast. Even in a dark room--much less a room with ambient light--this won't be an issue if you're using a large enough screen to see all the extra detail that 4K resolution offers. Color accuracy. Both projectors offer good enough color accuracy with default settings for at least one color preset so you'd have to compare the images to a calibrated reference display to be sure they're off at all. And to the extent they are off, they are easy to adjust. Both projectors are also ISF certified. Pay an ISF-certified technician to adjust them, and you'll have fully calibrated ISF Day and Night modes added to the menus. HDR. Both projectors handle HDR nicely, maintaining suitable brightness in both bright and dark scenes, and holding shadow detail well. The main difference between the two is that the default settings on the UHZ65 take the inherent limitations of projector technology into account, to deliver a compelling picture. The RS440U's defaults are closer to the spec, which darkens the overall brightness so much that bright scenes are dull and shadow detail gets lost in dark scenes. However, to get just as compelling an HDR image on the RS440U as on the UHZ65, you need only adjust gamma or brightness and contrast settings. Light source and Imaging Technology. Many of the differences between the RS440U and the UHZ65 stem from their light sources and imaging technologies. The RS440U uses a standard lamp, three LCoS chips, and e-Shift5--JVC's version of pixel shifting. The UHZ65 uses Optoma DuraCore laser technology and a single DLP chip. Resolution. The RS440U uses native 1920x1080 D-ILA chips--JVC's version of LCoS--along with pixel shifting to create an image with subjectively close to 4K resolution but without the ability to define 8.3 million descrete pixels. The UHZ65's one 4K DLP chip that features 2716x1528 mirrors. This also uses pixel shifting, but it is able to deliver 8.3 millon addressable pixels on screen. Lamp vs. Laser-Phosphor. The low cost of the RS440U's standard lamp compared with the UHZ65's laser-phosphor light source is one reason the RS440U can cost less than the UHZ65 and still have a more expensive lens system, with powered lens shift, focus, and zoom, compared to the manual zoom lens on the UHZ65. Total cost of ownership. At this writing, the RS440U costs $500 less than the UHZ65. However, if you plan to put a lot of hours on your projector the UHZ65 will be the less expensive projector in the long run. The laser light source is meant to last the life of the projector, with a rated lifetime of 20,000 hours. The RS440U lamp rating is 3,500 hours with High lamp power or 4500 hours with Low lamp power. If you replace the $599 lamp even once, the RS440U's total cost of ownership will be the higher of the two. Lenses and Constant Image Height (CIH) Setup. The RS440U offers a motorized focus, 2x zoom, vertical and horizontal lens shift, and lens memory. The combination will be particularly appealing if you want a CIH installation with a 2.4:1 screen without the extra cost of an anamorphic lens. The UHZ65 lens is not powered, it has a smaller zoom range at 1.6x, and it has vertical lens shift only. Placement flexibility. The RS440U has a larger range than the UHZ65 for both zoom and vertical lens shift. It also adds horizontal lens shift and vertical keystone adjustment, which the UHZ65 lacks. Together, these features give it far more flexibility for placement and potentially easier installation. Maintenance. Along with the RS440U needing lamp replacement, its dust filter needs occasional cleaning and potential replacement. The UHZ65 doesn't need anything replaced or cleaned, making it maintenance free. It is also compliant with IP5X for dust resistance. 3D. The RS440U offers Full 3D. The UHZ65 supports PC-based 3D only. Brightness. Brightness comparisons between LCoS and DLP projectors are complicated by DLP's Brilliant Color. The primary effect of the feature is to boost white brightness, which mostly helps images like a Word document rather than color images. In addition, depending on how Brilliant Color is implemented, it can affect color accuracy. The good news for the UHZ65 is that for all but one color preset, the color brightness is 60% to 95% of white brightness. Anywhere in that range is high enough to have little to no effect on color quality as well as ensure that brightness for color images isn't far off what you would expect from the white brightness. The only exception is Bright mode, which increases white brightness so much with default settings that color brightness is only 30% as bright. Bright mode has an obvious magenta bias, but you can improve color accuracy dramatically by using a lower Brilliant Color setting. In short, the high lumen reading in Bright mode makes the UHZ65 technically brighter than the RS440U, but it is a mode few would want to use for most video display. The measured ANSI lumens for the default settings for each color mode of each projector follows. All measurements were taken with the zoom lenses at the widest angle setting. The measurements for the RS440U are shown for both High and Low power modes. Measurements for the UHZ65 are shown for Full, 75%, and 50% power, but the setting allows any power level from 100% to 50% in 5% increments. Eco Modes. The RS440U's Low lamp mode lowers brightness by about 30%. The 10 steps below 100% for the UHZ65 each lower the measured brightness by 5% of the Full brightness measurement. Zoom lens light loss. The RS440U's 2x zoom lens curtails light by 18% at the telephoto end of the range compared with the maximum wide angle setting, while the UHZ65's lesser zoom, at 1.6x, curtails light by 23% at the telephoto end. Brightness uniformity. The RS440U's 87% brightness uniformity translates to a variation in brightness that's barely visible with a solid white image and not visible at all with any image that breaks up the field of view. The brightness variation with the UHZ65's 56% uniformity is easy to see with a solid white image. However, almost any film or video image masks the variation since the eye will tend to interpret any visible variation as being in the original image. Rainbow artifacts. The RS440U's LCoS design eliminates any possibility of rainbow artifacts. The UHZ65 shows them infrequently enough that it is unlikely anyone will find them bothersome. Onboard stereo. Because home theater projectors in this price range are intended to be used with a high quality external sound system, many of them, including the RS440U, don't have onboard speakers. The UHZ65 offers stereo 4-watt speakers with sound quality and volume in the same league as a large-screen TV. Input lag. The RS440U produces an input lag of 42 ms with video processing features like frame interpolation turned off. The lowest lag the UHZ65 delivers is almost twice that, at 80 ms. Fan noise. The RS440U has the lower level of fan noise of the two--so much so that the audible noise rating for its High power mode is lower than the rating for the UHZ65's lowest power mode, at 26 dB vs. 29 dB. That said, even with the UHZ65 in its highest power mode, unless fan noise is one of your pet peeves, the low-pitched whoosh isn't likely to be an issue if you're sitting more than five feet away. JVC says to use the RS440U's High Altitude mode at 3,000 feet and above. The recommendation for the UHZ65 is 5,000 feet and above. With both set to High Altitude mode, RS440U is far quieter. The UHZ65's High Altitude mode is loud enough that if you need to use it, you should consider positioning the projector behind a false wall or behind the screen to deaden the sound. Warranty. Both projectors come with a three year warranty, with the UHZ65 warranty including the laser light source. JVC warrants the lamp on the RS440U for one year or 1,000 hours. The JVC DLA-RS440U and Optoma UHZ65 both deliver high quality images with fine detail, high contrast, saturated color and a notable sense of three dimensionality. The one exception is that if your installation requires you to reduce brightness on the UHZ65, it will lose enough contrast to notice. That won't happen with the RS440U, which is a good enough reason to choose it for smaller screen applications in a dark viewing space. For other situations, choosing between the two can still be easy. The RS440U is the obvious pick if you want to have Full 3D, a lower input lag for game playing, lower fan noise, a powered lens and lens memory for a CIH setup without needing an anamorphic lens, or its large zoom range and lens shift for flexible positioning. If you don't need those features, the Optoma UHZ65 offers a set of advantages of its own. You would select the UHZ65 if you want its subtely higher resolution of true 4K (which is most noticeable with particularly demanding, high-resolution graphics, like CAD/CAM images with lots of fine lines close together), a maintenance-free unit, compellingly watchable HDR even without tweaking settings, the ability to get exactly the brightness you need by adjusting the power setting in 5% increments, or onboard audio. Also for altitudes between 3,000 and 5,000 feet, the UHZ65 has the advantage of not needing High Altitude mode. At 5,000 feet and above, the RS440U has the advantage of its High Altitude mode being much quieter. If none of these stands out as a "must have" feature, the choice may come down to whether you'd rather have a lower initial cost with the JVC DLA-RS440U or a lower total cost of ownership with the Optoma UHZ65. Either projector will give you excellent--and in most circumstances essentially equivalent--image quality, each offers its own unique combination of features, and either one will deliver an outstanding home theater experience. The "much better blacks" of the JVC makes it an absolute slam dunk for the vast majority of home theater owners. Your review references this huge advantage as if it were a footnote. Not that it matters anyway as the JVC meets or beats the Optoma in every attribute, excluding their bulb extortion program of course. DavidK: I fully understand your reaction. When I first looked at the Optoma UHZ65 projecting a 100% black image my immediate thought was that the contrast must be horrible. But when I started projecting images that would show poor contrast, I was pleasantly surprised that the contrast was anything but awful. The reality is that the darkness of a given projector's black is only one factor in how good the contrast will be and how good the image will look. And if you look only at the one factor by itself, it's easy to be mislead. Bottom line is that the darker black of the JVC model by itself is will tell you no more about how the image will look than the 10 times higher contrast ratio rating for the Optoma unit. As I said in the review, there are scenes in the clips that I tested with that show better contrast with the JVC projector, and others that show better contrast with the Optoma projector. The far deeper blacklevel of the JVC combined with its almost double color-brightness of 1675lm compared to the Optoma's 900lm color-brightness means that any appearance of similar contrast from the Optoma is achieved with software tricks like dynamic scene range stretching and floating gamma. Cool tricks when they work nicely, but tricks which can't help much in darker scenes except by stretching/brightening shadow-detail. In cheaper displays this software often results in some banding with gradients and loss of visual texture on skin and other lightly textured areas, but I haven't played with the UHZ65 yet. Somecomments, basically, this is the underlying explanation for why the UHZ65 has better apparent contrast in some scenes and the RS440U has the better apparent contrast in others. I did not see the posterizataion in gradients or loss of visual texture you mention, but it's possible they might show up in clips that are prone to those issues. The clips I use for testing were chosen because they bring out other issues, like rainbow artifacts and loss of shadow detail. "Somecomments" and M. David Stone, I have calibrated a few of these UHZ65's and did see a scene in The Revenant that showed pretty severe banding in the sky above Bridger's head. I was able to alleviate this by inputting a 4:4:4 10 or 12 bit 4K24p signal form my Panasonic UB900 player. If left at the default 4:2:2 12 bit, then the banding was present. I agree with your review that looking at just a black screen makes you wonder about contrast, but as soon as you actually play the video, including dark scenes, you will be pleasantly surprised! I wasn't expecting much with these, but my preconceptions were wrong on this one. Thanks for this interesting comparison review. JVC projectors are renown for their inky black levels (and extortion-priced lamps). The Epson 5040UB has gotten such great reviews for picture quality with impressive black levels as well so it would be great if you could consider comparing the UHZ65 with the Epson 5040UB even though the UHZ65 costs around twice as much as the Epson. In any case, I read your original review of the UHZ65 in which you state: "There is also no visible change in black level when you change brightness by adjusting the power level, which has settings from 50% to 100% in 5% increments." However, in this shoot-out with the JVC you state: "The UHZ65's contrast drops noticeably at lower power levels." So, if reducing power level on the UHZ65 causes a loss of contrast and the black level doesn't change at reduced power levels (per the original review of the UHZ65) are you saying, in effect, that at lower power levels the UHZ65 produces a darker image overall? (Also, perhaps it was a typo in your printed review but Optoma shows a contrast ratios of 2,000,000:1 not 4,000,000:1 as stated in the shootout review). Based on your testing of the UHZ65 can you gauge at what smaller screen size the break-point for the loss of contrast on the UHZ65 with a lower power setting would be (or the specific power level) with the setup you used (i.e. your diagonal screen size and distance from the screen) where the loss of contrast seems to occur? Thanks for this comparison review! Peter: The short answer to your question asking whether lower power levels produce a darker image overall is yes, sort of, but not the way you probably mean it. If you start with an appropriately bright image, and then lower the power level without changing the image size, the image will be darker overall. But it's also true that if you shrink the image size and don't change the power level, the image will be brighter overall, and can get too bright. The goal is to pick the right power level for the image size to give you roughly the same overall image brightness regardless of size. What the two sentences you're asking about really relate to is contrast ratio. To the extent that the effective contrast depends on black level (as opposed to video processing and the like), what really matters is contrast ratio--the ratio between the brightest and darkest levels the projector can produce. By definition, the brightest level drops at lower power and brightness levels. If the darkest level stays the same at all power levels, the ratio of brightest level to darkest level will also fall, and so will the effective contrast. On your question about a break point for the loss of contrast, there's no good answer. Go from 100% to 95% and it is hard to see any difference. Go from 100% to 85% and you'll see a difference, but may still consider it acceptable. There is no sudden leap at any one 5% step from okay to not okay. And where you want to draw the line is really a subjective judgment. Finally, I don't know if the typo was mine or in some Optoma material, but the site and data sheet are indeed showing a 2,000,000:1 contrast ratio. Thanks for pointing that out. It's now correct in the text.